SPRINGFIELD, Mo. — The last time the Cardinals trotted onto Hammons Field, it was Adam Wainwright on the mound. Tonight, it was Michael Wacha’s turn. Springfield fans were treated to a fourth straight home game with a key rehabbing St. Louis Cardinal playing in their hometown, this time witnessing two-plus innings of work from the 2013 NLCS MVP. 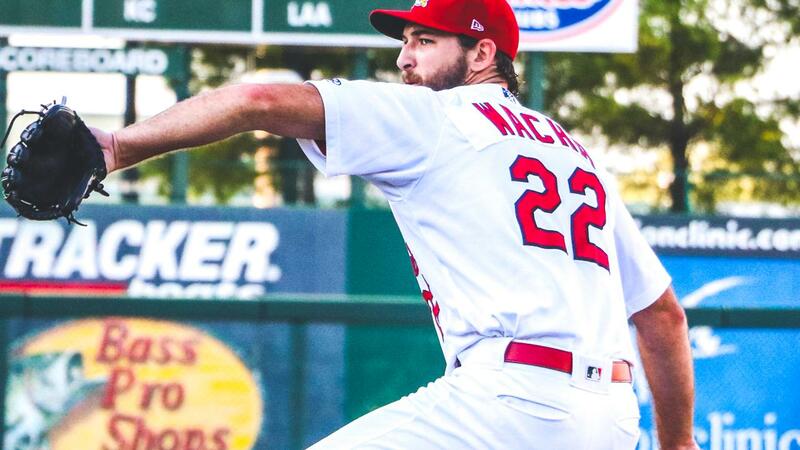 Wacha allowed three earned runs over 2.1 innings of work and tossed the highest number of pitches since his rehab assignments began in Palm Beach just under two weeks ago in a 9-3 Cardinals loss to the Travelers with 4,386 fans watching. Wacha struck out three Travelers, allowed six hits and walked one. His line included two unearned runs. The first two Cardinals runs came off Jose Martinez’s first Double-A hit. His fifth-inning single to center brought Evan Mendoza and Victor Roache in, cutting what was a 7-0 deficit to 7-2. Trailing 9-2 in the ninth, Andrew Knizner hit his seventh home run of the year to wrap up the 9-3 final. The Travelers got on Wacha and the Cardinals early when Chuck Taylor singled in Beau Amaral. The run was unearned after Amaral previously advanced to second on a passed ball. In the second, another passed ball pushed Arkansas ahead 2-0. This one came on a swinging third strike that ended in Donnie Walton scoring from third and Amaral reaching first seconds after the would-be third out. Wacha’s three earned runs came off one swing. Kyle Lewis took the Cardinals starter deep for a three-run homer with one out in the third. Wacha was removed from the game after the homer. Eric Filia drove home the sixth and seventh runs for Arkansas off a fourth-inning single. In the seventh, the Travelers got runs eight and nine off a Yonathan Mendoza single and a Chris Mariscal force out that brought in Joseph Odom. Landon Beck tossed a scoreless eighth and ninth for the Cardinals, striking out three to only one hit. The Cardinals and Travelers play the second game of a four-game set Wednesday night with first pitch scheduled for 6:30pm and gates set to open at 5:30pm. Wednesday is our final Purina Woof Wednesday of the season. One dog will leave Wednesday’s game as the proud owner of a year supply of Purina Dog Food. Owners can still enter their pets into the drawing at Guest Services on Wednesday.